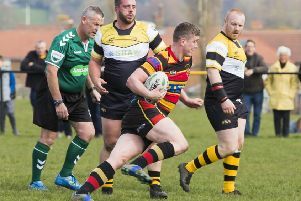 Old Rishworthians saved their poorest performance of the season for the last match and lost 27-13 at home to a Knottingley side fighting for their Yorkshire Two lives. However, the visitors’ joy was short-lived as an unexpected victory for Leodiensians at Pontefract left Knttingley needing a win at already-promoted Keighley next week to avoid relegation. In the first half Rishworthians had to defend well against determined opponents but also had several chances to take the lead. Left wing Rhys Town called for the ball in space and a long pass from Josh Kelly put him away on a 50-yard burst. No 8 Nick Faulkner put in several bullocking runs and teenage flanker Harvey Keighley-Payne, outstanding throughout, was denied as the ball bounced dead after he had charged down a kick. The home side ended the first half with a Joe Billing penalty, which was cancelled out right at the start of second period by a long range kick. Mistake after mistake eventually led to the Knottingley left winger squeezing over in the corner for a converted try. The home side fought back and both Faulkner and Keighley-Payne almost got over before the ball went out for Billing to touch down, but his conversion attempt hit a post. It looked as if Rishworthians might at last get their game together but they gifted the visitors a converted try. An unnecessarily rocket-like pass almost knocked its intended recipient over and the loose ball went to an opponent for a simple run in. From there Rishworthians’ play got even sloppier and a delighted Knottingley side quickly ran in two unconverted tries to grab a bonus point. Although the home side dominated the remainder of the game they failed time and time again to get the ball wide. Centre Matthew Hunt-Brown was held up over the line, as was Faulkner, before at last they sent it wide and replacement centre Kurt Sutcliffe easily got in for an unconverted try.